Approximately 380 miles of pipelines and 11 pumping stations serve as the sanitary collection system backbone to direct this community's domestic and industrial wastewater to its treatment plant, the Hale Avenue Resource Recovery Facility (HARRF). 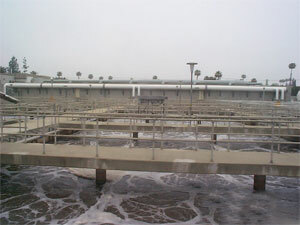 The HARRF is an activated sludge, secondary treatment facility. This consists of physical, biological, and chemical treatment methods, which include screening, sedimentation, chemical precipitation, and biological processes. The HARRF is designed to treat a flow of 18 million gallons per day (MGD). The City operates the HARRF for the benefit of the City and the Rancho Bernardo area of the City of San Diego. Operating 24 hours a day, the average daily flow is 12.7 MGD, comprised of Escondido's flow of 9.7 MGD and Rancho Bernardo's flow of 3.0 MGD. The wastewater, called effluent, is treated through a series of complex processes to a level of quality that is safe to discharge from the HARRF to the Pacific Ocean via a 14-mile long land outfall pipeline that connects to an ocean outfall pipeline near San Elijo Lagoon. The effluent exits the outfall pipeline approximately 1.5 miles offshore through diffuser ports 110-feet deep in the Pacific Ocean. The City sends the organic material, called biosolids, to Yuma, Arizona for beneficial reuse as a soil amendment. HARRF has twice been awarded "plant of the year," once by California Water Pollution Control Association and also by the California Water Environmental Association. Started at the HARRF in the Fall of 1998, Phase I Construction is a major rehabilitation of existing facilities and will improve secondary treatment efficiency. Phase II Construction, completed in 2001, adds tertiary treatment capability to create high quality water production for reuse as irrigation on local golf courses, parks, school grounds, green belts, roadway medians, open spaces and industrial use. Phase III Construction, includes a replacement administration building (completed 8/15), and a rebuild of the influent pump station (completed 2/16) and the primary treatment building (completion date 1/18). Public tours of the HARRF by interested groups, citizens, and schools are available by appointment.